Why is it that the cognitive domain of learning plays such a visible, central role in mainstream conversations about learning theory and practice in higher education while the affective domain frequently takes a back seat? Sprinkled throughout the web, we find visuals of Bloom's taxonomy of the cognitive domain (nowadays usually the revised version) in a myriad of formats. Here are the results of a Google Image Search using the terms "Blooms taxonomy." Take a peek. How many results illustrate the affective domain? The cognitive domain is, of course, critical to learning and I do not intend to belittle its importance in any way here. But I think it's important to unveil the lack of critical discourse that has developed around the affective domain as our learning landscape has gradually moved into the online environment in recent years. The affective domain contributes to the development of a student's motivation, confidence, how relevant they perceive the content to be, and how meaningful their learning experience is to them (Polhemus, Shih, Richardson and Swan, 2000). The affective domain shapes learning into a meaningful, relevant, life changing experience. All of these factors are critical contributors to powerful, inspirational online classes (Zvacek, 1991). The affective domain, according to Donald Clark, "includes the manner in which we deal with things emotionally, such as feelings, values, appreciation, enthusiasms, motivations, and attitudes." As an online teacher, these are critical skills that contribute to my students' effectiveness to participate as a member of our learning community. Fostering these skills is a gradual process that begins in week one and progresses throughout each week and is practiced and improved upon in each of our activities. For this reason, the activities (or most of them), need to be designed with tools that foster a participatory environment and empower students to develop a shared sense of purpose in the community. As online educators, we must be consciously aware of how we are fostering our students emotional and social learning in online environments and explore how hybrid environments can expand and heighten these skills in a class. Doing so will ensure that pedagogies that leave out socialization, which were so eloquently refuted by Cathy Davidson here, will not become mainstream delivery methods within higher education in the future. We must cultivate the emotional intelligence of our students and understand what that means to do so within a 21st century context. 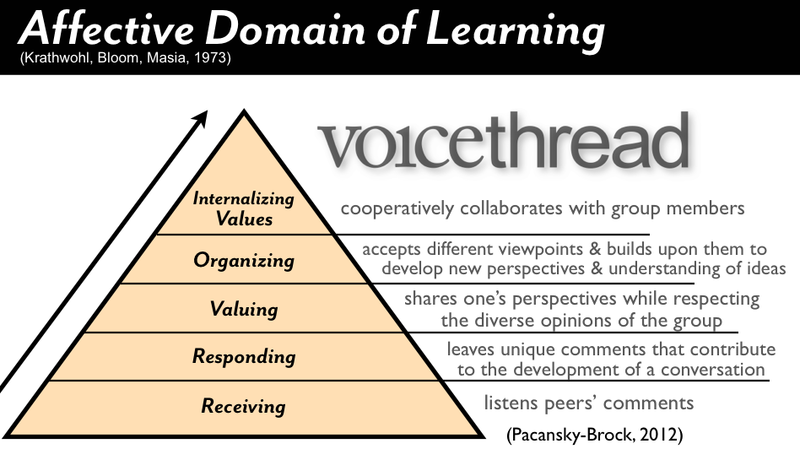 At the top of this post is a graphic I created to illustrate how I use VoiceThread, a web-based participatory tool that fosters conversations around media, to foster the affective domain. I welcome your comments and questions, as I consider this a working draft. 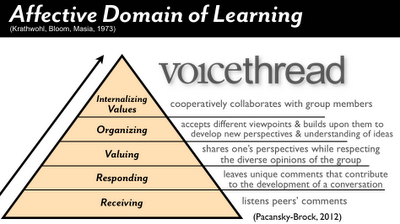 What tools do you use that scaffold the development of the skills in the affective domain in an online class? And how do you employ them? the WWW and the Internet (WebNet); San Antonio, TX. Zvacek, S. M. Effective affective design for distance education. Tech Trends. 1991; 36: 40-43. As we begin to integrate more 21st century skills in our educational systems. The need to foster students' emotional and social learning is extremely vital. We can't assume just because they were born in the age of computers and use social media that they are aware of the impact that these things have on them. It is our responsibility of educators to prepare students to be good digital citizens. I definitely agree with the statement, "We must cultivate the emotional intelligence of our students and understand what that means to do so within a 21st century context."